iDirect Satellite broadband for Asia and the Pacific. This iDirect service is provided by Oceanic Broadband Solutions Pty. Ltd., based in Melbourne and Gold Coast, Australia. 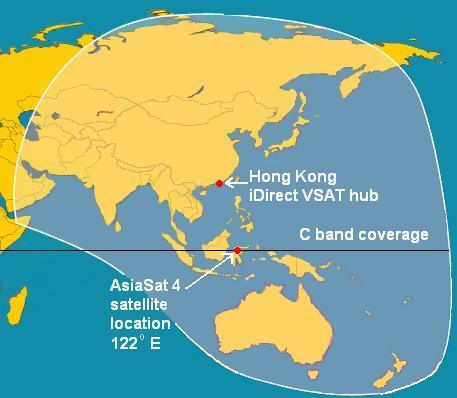 The company operates an iDirect VSAT hub at the AsiaSat teleport in Hong Kong and uses the C band beam coverage of AsiaSat 4 satellite at 122 deg East longitude, as illustrated on the right. They are reported to have implemented a major VSAT network for the Papua New Guinea (PNG) University, linking several University sites and Colleges plus numerous local WIMAX and WIFI wireless access points and links. AsiaSat 4 satellite: launched 11 April 2003. 28, linear polarisation, C band transponders, peak EIRP =41 DBw, 55W. Pages on this satsig.net web site are Copyright Satellite Signals Limited © 2009 all rights reserved.